Pruning Tomatoes: Don't You Have Anything Better To Do? Once again, two tomato care questions have reappeared here: "Should I prune off (snip off, pinch out) the first tomato flowers that appear, in order to get more tomatoes later?" And, "Do I need to prune my tomato plants?" Those early tomato flowers, especially if the weather doesn’t cooperate, will fall all by themselves, thank you. Your assistance is not needed. And if you want to prune your tomato plant, you better have a damn good reason. Flower drop and tomato fruit set failure can happen in May and June for a number of reasons, including night temperatures below 55; daytime temperatures above 90; excess nitrogen fertilizer, too much shade, too much smog, plants set out too early in spring, or planting the wrong variety for your area (Beefsteaks and San Francisco is not a match made in heaven). Bad move, taking gardening advice from a person who guesses for a living. Still, that piece of poor advice must have some historic legs to it. And sure enough, there are many people at Internet gardening forums who are passing on this wrong-headed notion. And as far as I can tell, it’s the result of one gardener reading a piece of university-based research on tomato pruning, and mangling the retelling of that research. Single crop rotation-seeded in July or by early August. Transplants set in greenhouse within 10 to 30 days of seeding. Harvest begins from 85 to 100 days following date of seeding and continues into June or early July. Cessation of pollination is six weeks before termination of the crop. Growing point is allowed to grow for at least five to seven leaves above last fruit truss to help prevent sunburned fruit. Remove flower buds above last fruit truss to assure no additional fruit set." Or something like that. And another digital gardening virus is born. PRUNE YOUR TOMATO PLANTS? WHY? “…you can grow perfectly fine fruit without pruning your plants. But if you want to prune, here are a few guidelines. For determinate types, there is no need to prune at all. For indeterminate types, allow one, two, or three suckers to grow from the base of the plant. Each of these will become a main stem with lots of flowers and fruit. Prune off all the others suckers and provide the plants with strong support. When and how should you prune tomatoes? Very little, only when necessary, to keep the plants within bounds. 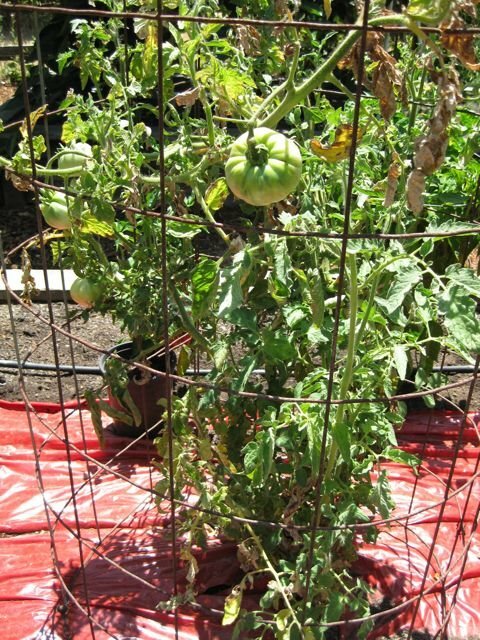 If you grow your tomatoes in cages (recommended), you would only need to remove those branches that escape and are threatening to wrap itself around a nearby pepper plant. And, it should be pointed out, that if you follow those pruning guidelines for staked tomatoes, you are sacrificing about 25% of your eventual tomato crop. That is yet another good argument to cage, not stake your tomatoes. Cages can be made from sheets or rolls of concrete reinforcement wire with a six inch mesh (the six inch opening makes it easier to reach those tomatoes). The sheets are usually 42” by 84”. 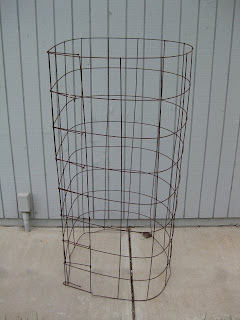 Snip off the vertical bars on one of the 42” ends, bend it into a circle, attach the horizontal arms from the snipped end around the other 42” side and you have a tomato cage that’s 42” tall and about 27” in diameter. And it will last for decades. Want a bigger cage? Turn the sheet sideways, snip one of the long ends, bend it into a circle, and you have a cage that’s 84 inches tall and about a foot wide. But I would only do that if I am trying to grow tomatoes as per the instructions of a square foot garden. 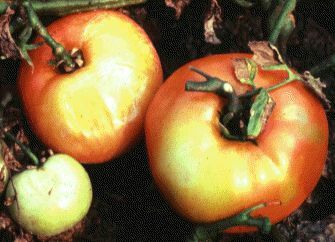 Sunscald (sunburn) of tomatoes. The fruit turns light brown and leathery on the side exposed to the sun. The solution? Don't prune the leaf cover from the plant! A final hint when searching for garden answers on the Internet. Be leery of advice from gardening forums, unless that advice is linked to a study or research that you can also access. When using a search engine, include the words to identify a prominent agricultural school where the advice is reviewed by multiple parties before publication: UC (University of California), WSU (Washington State), Cornell, TAMU (Texas and M), etc. For example Googling the phrase “tomato worm UC” will lead you to the University of California Integrated Pest Management website first. If you were to just enter the words, “tomato worm”, well…good luck.